THE HISTORIC market town of Oudewater lies in the official ‘Green Heart’ of the crowded Netherlands, a green buffer zone that prevents the cities of Amsterdam, Utrecht and Rotterdam reaching out to form one huge Tokyo-style conurbation. Oudewater is a 50-minute bus ride from local provincial capital Utrecht, past the occasional windmill and car showroom and along neat and tidy maize fields and well-kept pastures grazed by enormous cows. Dutch agriculture is a very orderly affair indeed. You can walk through charming little Oudewater, with the narrow river Ijssel running through the middle of it, in a few minutes. It has waterfront brick houses dating from Holland’s 17th century ‘Golden Age,’ with gables and staring ornamental heads above the door. Subsidence over the years has made some of the houses lean forward at eccentric angles. Like many Medieval Dutch market towns, Oudewater still has its old waag, its weighing house, where weights and measures were officially set. In an agricultural economy based on commodities sold by weight, the weighing house would have been one of the town’s most important institutions. Oudewater’s weighing house is an unassuming little two-storey stone building on the waterfront, on the corner of Leeuwingen Street. But Oudewater’s weighing house is world famous as the Heksenwaag, the ‘Witch Weigher,’ the place where desperate people accused of witchcraft came to from as far away as Germany and even Hungary to be officially weighed to determine whether or not they were witches. The Heksenwaag still weighs people to check whether they are witches, on an industrial scale. When I visited, the salaried Weighing Master (in fact a weighing mistress) was taking a well-earned day off, and volunteer Maaike den Boer was interrogating and weighing day-tripping families at the rate of about one every three minutes. Her volunteer colleague, Jaap van der Laan – also the Heksenwaag’s Spanish interpreter – somehow found time between weigh-ins and signing visitors’ certificates to tell me the Witch Weigher has around 70 punters a day stepping onto its scales in the summer high season, and Jaap estimated that their all-time record is close to 2000 in a week, including all the school trips, parties and weddings. They still use the 500-year old wooden scales, all original except for the ropes. August sunlight poured in through the high windows at the top of the weighing chamber, which is a large room with a high ceiling, with an old iron balance from which thick ropes suspend two plain, square wooden platforms big enough to comfortably accommodate one person. The platforms hang just above the floor – I somehow managed to get my size 11 boot wedged fast between the floor and the scale. The witch weighing procedure is as follows: you stand on one of the scales, while the volunteer interrogates you about your personal habits – cooking with herbs, a love of walking in the woods, and a preference for mushrooms are all suspicious signs. Then there’s the question about whether you’ve ever eaten an egg that’s been brooded on by a snake. Tip: answer ‘no’ to this one, a ‘yes; answer is apparently a dead giveaway. The interrogation complete, the inquisitor then loads some big old cast iron weights on the other scale. You need to weigh a minimum of 100 pounds to clear the witch-test (the weights have actually gone metric), but there are complicated adjustments for your height, build and age. They’re vague about this formula, but when I was there, everyone was declared of ‘normal body weight for a human’– even the girl who I though had rather blown her chances by putting on the tall fancy dress witch’s hat and clutching the broomstick she’d found lying on a nearby bench. On payment of an extra €I, I walked away with a certificate in Dutch with 16th century spelling. While the certificate didn’t explicitly state that I wasn’t a witch, it did confirm that I had a normal weight for a human of my ‘bodily proportions’, and it bore the stamp of the Town Council of Oudewater. (English versions are available too.) The current Queen Beatrix of the Netherlands was weighed back in April 1952, and monarchists will be glad to hear that a constitutional crisis was no doubt averted by the confirmation that she was not a witch either. We can all laugh today at this Monty Python and the Holy Grail-type tourist attraction – the film features a distinctly dodgy-looking witch weighing in which the accused was declared a witch after she was found to s weigh exactly the same as a duck – but witch weighing once a deadly serious business. Witches were thought to be supernaturally lightweight, which is why they had the power of flight. Desperate witchcraft suspects – often accused because of family feuds, land disputes or anonymous letters in the local mayor’s letterbox, came from far and wide to get a certificaat from Oudewater’s Heksenwaag. Its reputation was enough to prove beyond doubt they were too heavy to be a witch, thereby saving them from the stake. Holland’s last mass witch trial was in the southern town of Roermond in 1613, in which at least 40 condemned were burnt at the stake, in a witch panic that may have been a manifestation of the contemporary Catholic counter-reformation. An unusually high proportion of convicted Dutch witches in the 16th century were children – often alleged to have caused the milk of nursing mothers or cows to dry up. The Seven Provinces of the Netherlands (the union of the majority Protestant provinces to the north) banned the death penalty for witchcraft in 1614, but other sanctions such as exile remained, and witch trials continued in the Catholic south. Dutch Protestant spiritual leaders continued to rail against witches long after the Reformation, and curiously, ultra-Protestant Holland continued to force feed Holy Water mixed with the wax of Easter candles to suspect witches, which was supposed to make them to reveal their true form. Two Dutch sceptics were significant in undermining belief in witchcraft, Dr Johann Weyer dismissed most witchcraft accusations as female hysteria, but believed there were some male witches. His work influenced the Scottish King James VI (later James I of England) and his witchcraft-sceptic book Daemonologie (1597). The Dutch Protestant minister Balthasar Bekker’s bestselling four-volume De Betoverde Weereld (The Betwitched World, 1693) concluded that the world had no demons or witches, and that these were the products of ‘heathen’ pre-Christian superstition. He didn’t completely rule out the existence of the Devil, but the Church authorities concluded that doubting the existence of the Devil would lead inevitably to questioning whether there was a God either, and he was declared a heretic and fled into exile in Sweden. Did the town fathers of Oudewater believe in witches? Jaap told me that original certificates issued by Oudewater witch weighers are in the Province of Utrecht archives, and they’re accompanied by long and chilling dispositions of the trials and the circumstances of the witch weigh-ins. Some of the defendants who were recorded as non-witches in Oudewater were strikingly lightweight and thin, according to these records. It may be that Oudewater’s Weighing Masters, having earned a reputation for integrity in weights and measures, quietly used their power to save the lives of hundreds of people charged with a crime whose very existence they doubted. There’s an extensive bilingual Dutch and English display on the history of Dutch witchcraft in the Heksenwaag’s attic, along with audiovisual presentations, an early edition of De Betoverde Wereld, and some reconstructed ‘witch rings’ – clumps of feathers that were supposed to have magically formed into rings, found inside the pillows of witches. Witch rings provided enough evidence to get you burnt at the stake following a 15th century witch trial, typically of ten minutes’ duration. The Heksenwaag is open every day from March to the end of September, 10am-5.30, admission is €4.50, excluding certificate of weighing. The Connexxion bus service 180 to Oudewater runs hourly from outside Utrecht Central Station, and more frequently from Gouda Central Station. Dutch Railways have discount advance deals on the Eurostar from London to any station in Holland. My article on using the Data Protection Act to get my police criminal intelligence report appeared in today's Guardian, with a companion piece on my case by Rob Evans. See today's Press Gazette blog, which has already picked it up. Follow their links to the original Guardian story, and see my comments on this on the Press Gazette blog. Fiction publishing may be “flatlining,” but more and more journalists are getting non-fiction books published, and having a book out gets you more work. Former Virago editor Rebecca Swift, of The Literary Consultants, and former Bloomsbury editor Matthew Hamilton, currently with literary agent Aitken Alexander, tell you how. 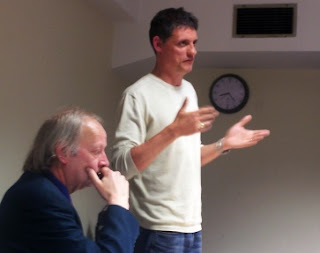 Leeds-based freelance Adam Christie (above, centre, in dark blue shirt,) says his regular work with both the Yorkshire Post and the local BBC "disappeared in an evening". He tells how he found work using his journalism skills "outside the media industry". Web designer and “new media” expert Gary Herman says most of the famous computer catastrophes were down to insufficient attention to the "spec", the specification of what a website or software tool is for. If you're considering paying someone to set up a website, or setting one up yourself, think very carefully about the "spec": what is the purpose of the site and how may it change in future? Read his advice here. And I’m currently helping to organise this conference on “new ways to make the media pay” for Saturday 16 January 2010. Back to Pygmy pachyderms Fortean Times article. (1) Hidden Giants – Forest Elephants of the Congo Basin, Stephen Blake, Wildlife Conservation Society, Rapac, Projet Especes Phares, AG Partners, Gabon, West Africa, no date given but circa 2006, ISBN 0-9792418-0-4. I would like to praise the impressive conservation projects carried out by the Wildlife Conservation Society (WCS) in the habitats of the forest elephant and other endangered animals, and to thank them for their help on this article. (2) ‘Pigmy Elephants,’ Guy Dollman, Natural History Magazine, Natural History Museum, London, vol 4, no 31, 1934. (3) ‘A propos des Formes Naines d’Elephant D’Afrique’, (on dwarf forms of the African elephant,) Mammalia Tome 26, Centre National de la Recherche Scientifque, Paris (no date given for Cameroon specimen). (4) ‘A Dwarf form of the African Elephant,’ Prof. Theodore Noack, Annals and Magazine of Natural History, London, vol 7, no 17 1906, This is a summary translation from German from Zoologischer Anzeiger vol 29, no 20 January 1906. ‘Pygmy elephants of Africa,’ Zoological Society Bulletin, R. L. Garner 1923 vol 26, New York Zoological Society, New York. ‘Our second pygmy elephant’, W. T. Hornaday, Bulletin of the New York Zoological Society, Vol 26, no. 1 1923. New York Zoological Society, New York. William Bridges, A Gathering Of Animals, an Unconventional History of the New York Zoological Society, Harper and Row, NY, no date given. The New York Zoological Society became the Wildlife Conservation Society. (6) ‘Evolution Status of the so-called African pygmy elephant (Loxodonta pumilio, NOACK 1906)’ Régis Debruyne, Arnaud Van Holt, Véronique Barriel, Pascal Tassy, Compte Rendu Biologies 326 (2003) 687–697 Natural History Museum/ Elsevier, Paris. (7) On The Track of Unknown Animals, Bernard Heuvelmans 1959, Richard Garner trans. (8) The mitochondrial DNA survey is described in Hidden Giants – Forest Elephants of the Congo Basin Stephen Blake, Wildlife Conservation Society. Dr Colin Groves’ comment on on herds of forest elephants that often don’t have bulls are on the ABC News website. Garner’s comments on Congo are from ‘Pygmy elephants of Africa,’ New York Zoological Society Bulletin, R. L. Garner 1923 vol 26. The controversy around hybrids prompted the African Elephant Specialist Group to put out a “position paper” stating their official view on hybrids. “Recent genetic evidence” would suggest that the savannah elephant Loxodonta africana africana and the forest elephant Loxodonta africana cyclotis “may in fact constitute two separate species… In addition, the existence of a third species, a West African elephant inhabiting both forests and savannahs in the region has been suggested… The (African Elephant Specialist) Group believes that the premature allocation of African elephants into separate specific taxa (species) would leave hybrids in an uncertain taxonomic and conservation status, and that more research is needed before such an allocation can be made.” Position Paper, African Elephant Status Report 2002. Thanks to Dr Victoria Herridge, who is researching elephant locomotion at University College London and the Natural History Museum, for her help on this article. Dr Herridge had a visit from the production team of the film 10,000 BC shortly before she showed me round the museum’s Bate Collection of pygmy elephant fossils. And yes, Victoria did advise them that mammoths couldn’t possibly have built the pyramids, and that mammoths and elephants don’t run – running being defined as when all the animal’s legs leave the ground at some point. (9) ‘Zur weiteren Dokumentation des Zwergelefanten,’ Wolfgang Böhme and Martin Eisentraut, Zeitschrift des Kolner Zoo (Journal of the Cologne Zoo,) 1990. The article also describes how Dr Claus Muller, who was the vet at the presidential Tatoma Zoo in Freetown, Liberia in the 1970s, said he regularly tended to two five-foot (1m 50cm) adult elephants. There are two photos of these elephants in the article, which are not of very good quality – in one of them Dr Muller and a woman are standing right in front of the elephants, so you can’t see much. An English summary is in ISC Newsletter (International Society of Cryptozoology) Vol. 11, No 1, 1991. Harald Nestroy is donating his fee for his photographs to his philanthropic projects in Bhutan. (10) The Dzanga Clearing study is in Hidden Giants – Forest Elephants of the Congo Basin, Stephen Blake. (11) Speculation on elephant populations during civil wars from Africa’s elephant – a biography, Martin Meredith, Hodder, London, 2001. Discovery of Sudan and Eritrea elephant herds from BBC News. The baboons acted as treetop look-outs, in return for which the elephants dug wells and grubbed up tubers for them to eat. Elephants are apparently able to smell water underground. (12) ‘Origins of the Elephants Elephas Maximus L. of Borneo,’ Sarawak Museum Journal 2008. (13) www.panda.org/about_wwf/what_we_do/species/about_species/az_species/index.cfm?uPageID=F. Numerous elephant population surveys for India and for all Asia give noticeably different statistics. See also ‘Asian elephant survey’ The Hindu, (Chennai, India,) 8 November 2007, www.thehindu.com. (14) “Malayali wildlife expert P S Easa” reported earlier kallaana sightings by the Kani in ‘Elephantine Paradox - Pygmy Jumbos Sighted,’ R Gopakumar, Deccan Herald, (Mysore, India,) 20 January 2005, www.deccanherald.com. 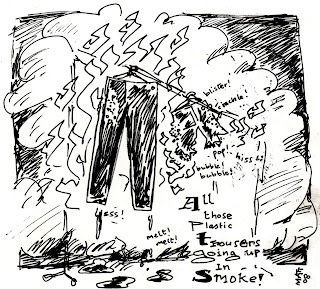 (15) ‘A group of four,’ Deccan Herald, 6 June 2005. In Search of India’s Pygmy Elephants, Sali Palode, Mallan Kani, Sanctuary Magazine, www.sanctuaryasia.com/sanctmagazine/archivedetail.php?id=664. 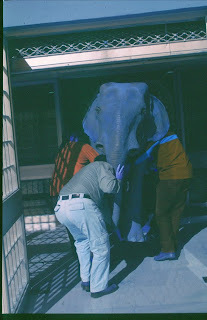 (16) Elephant Days and Nights, R. Sukumar, Oxford, Delhi 1994. (17) ‘Move to track pygmy elephants abandoned,’ K.S. Sudhi, Telhelka, January 18 2005. ‘21 elephants found in Western Ghats at Kanyakumari,’ The Hindu, 6 January 2008. Emails, faxes and letters sent to Peppara Reserve Wildlife Wardens, to the office of Kerala Forests and Wildlife’s Principal Chief Conservator of Forests and to various named people at Kerala Forest Research Institute (KFRI) enquiring about possible results from the DNA test on the alleged kallaana carcass elicited no reply. No one picked up the phone on the several occasions I rang all the numbers listed for KFRI. As my mum said, they were probably out in the forest. This is a slightly longer version of my article, which appeared in Fortean Times 251, with an update (14/04/13, in bold in the text) after having talked to Dr Victoria Herridge again in 2013. ELEPHANTS are the world’s largest land animals, but some claim there are pygmy elephants out there too. The fossil record has a rich variety of extinct pygmy elephants from around the world. But there are also reports of living pygmy elephants – India’s kallaana, Thailand’s Chang Khom, and West Africa’s “wakawaka” and Loxodonta pumillio. Following good Fortean practice, I present below some evidence for and against pygmy elephants, and leave readers to make their own minds up. The known prehistoric pygmy elephants of the fossil record were as small as 3 foot (just under one metre) at the shoulder, with babies as small as a large cat. Some may have still been around when the first humans arrived on their island habitats, as recently as 6000 years ago. By comparison, “pygmy elephant” is a misleading description of modern cryptid pachyderms. Alleged present day pygmy elephants aren’t supposed to be that small. Witnesses describe them as around five foot (150cm) high at the shoulder, so they’d still be powerful beasts by anybody’s reckoning. The savannah elephant, the biggest of all elephants, lives in East Africa, and also shares space with the forest elephant L. africana cyclotis in Central and West Africa. Forest elephants are found in rainforests, and compared to savannah elephants they’re stockier and rounder, with straighter, thinner tusks and with a smaller adult size range – from 6.6ft-9.8ft (2-3m). Hannibal’s elephants that crossed the Alps were probably all forest elephants. Other often-cited evidence for “pygmy elephants” comes from around 1911, during the exploration of Lake Leopold II in the Belgian Congo (now the Democratic Republic of the Congo’s Lake Mai-Ndombe, or its tributaries, reports are vague). A Lieutenant Franssen (presumably in the Belgian army) heard stories from the local Bongo tribe of an unusual elephant dwelling on the shores of the lake, and was determined to bag a specimen. Following its tracks, which were “very different to that of an elephant,” he eventually did shoot a specimen of what is certainly a strange-looking elephant, and estimated from its corpse that it would have stood 1.66m (5ft 4in) tall. Franssen named it Loxodonta africana fransseni, and died of a tropical fever soon afterwards. There was another unusual elephant sighting around the lake at around that time, of a “troupe of six individuals”, all with short trunks, short ears, and a longer than usual neck. The size of these elephants “did not pass two metres in height” – well within the range of an adult forest elephant. Locals called it wakawaka, the elephant that “comes with the rains”. Nestroy photographed what he claimed was a herd of pygmy elephants, and soon afterwards he photographed a group of conventional-sized forest elephants and buffalo in the same clearing, which helped give an idea of scale. One of his two pygmy elephant herd photos shows a large bird, a while cattle egret, standing behind one of the adults, from which it is estimated the adults in the group are 1.50m (5ft) tall, at least a foot shorter than forest elephants should be. Heuvelmans conceded that Africa’s pygmy elephants “may merely be the freak offspring of normal elephants. It is often difficult to distinguish between true pygmies and pathological dwarves.” It is of course possible that there were races of African dwarf elephants, but they’ve been wiped out in three waves of mass elephant slaughter – in the early twentieth century, for ivory billiard balls, until World War One caused the ivory market to crash, in the 1970s and 1980s Asian consumer ivory boom, and in the current desperate civil wars of Africa, which have introduced a lot of cheap automatic rifles into the continent and displaced many people deep into the jungle with no livelihoods. A 1994 US Fish and Wildlife Survey reconnaissance flight found an undiscovered lake in the remote Odzala National Park, in Congo Brazaville, littered with 200 elephant carcasses shot within the previous three years. Another elephant kill site, with over 100 slaughtered elephants shot within the preceeding two years, was found in Chad in 2007. A dwarf elephant population could have been eradicated by poachers – or displaced from its habitat and bred out by mating with other elephants – and we’d never know it. The determination of Lieutenant Franssen, the Governor of Sierra Leone and others to shoot and bring back a definitive “type specimen” to prove the existence of pygmy elephants seemed guaranteed to drive them to extinction if they ever existed. Hunters may even have made up pygmy elephant to legitimise their activities. According to Heuvelmans, British big game hunter W R Foran claimed in the 1950s that pygmy elephants were invented by ivory traders, as it was then forbidden (under Congo Free State “special permits”) to kill elephants that weren’t fully grown, so when poachers shot a young one they pretended it was a pygmy. P.T.Barnum’s five-foot stuffed ‘pygmy elephant,’ once exhibited alive, still exists and was auctioned to a private collector in 2006. But it was such a botched taxidermy job that it’s hard to draw any conclusions about its size when alive. The evidence for living Asian pygmy elephants in India seems stronger. The Asian elephant Elephas maximus (often called “Indian elephant” outside Asia) shows great variation in size and physique across the continent, with some populations given dubious sub-species designations, and one variety already unofficially known as “pygmy elephants.” The Indian mainland elephant, Elephas maximus indicus weighs 2.5-4.5 metric tonnes and stands up to 3m (almost 10ft) at the shoulder. There’s such a range of elephant physiques within India that there’s even a “caste” system for describing different builds of elephant – the koomeeriah (“thoroughbred”) is the stocky, barrel-shaped, well-proportioned variety and mriga (Sanskrit for “deer”) is a slimmer and more delicate elephant type. Female Asian elephants usually lack tusks, and some of India’s bigger males are makhnas – without tusks. As you go east of India, Asian elephants get smaller and lighter in colour. Thai, Vietnamese, Cambodian and Burmese elephants, and the handful of elephants still living in Bangladesh and China, are smaller than India’s, as are Sumatra’s elephants, which live in 44 completely isolated populations, and which some designate as a separate sub-species, Elephas maximus sumatrensis. The elephants of Borneo are described by the World Wildlife Fund and others as “pygmy elephants,” but they are still massive beasts. With a height of around 6ft (1.8m) at the shoulder, they’re only six inches (15cm) shorter than their distant cousins on the mainland. Borneo “pygmy elephants” have proportionally bigger heads compared to their body, their faces have a rather comically sad expression, and their tails reach almost to the ground. Proportionally bigger heads were a characteristic of the much smaller extinct island dwarf elephants of the fossil record. Research into Borneo elephant DNA in 2003 showed that their ancestors separated from the mainland population about 300,000 years ago. Confined to the northern tip of the island, Sabah, in Malaysian territory, and on the endangered list, Borneo’ “pygmy elephtants” are down to about 1000 living individuals. Elephants on Sulah were hunted to extinction some time around 1800. The inhabitants of Sabah have long regarded the island’s wild elephants as having a domestic origin, and the island’s elephants have a reputation for being less aggressive than their Asian cousins. The designation Elephas maximus borneensis is still unofficial. According to the Kani tribals, kallaana are shyer and less aggressive than conventional Asian elephants, and avoid contact with them. Sali Palode, an art teacher from the village of Palode, Kerala, and a professional photographer who won India’s Wildlife Photographer of the Year Award in 2007, photographed what he claimed were several kallaana on 8 January 2005. Palode had been on the trail of kallaana for five years, a quest that was based on the sound Fortean principle of asking the locals – he had been alerted by Mallan Kani, a local “tribal” guide, who brought him to the banks of the Karmana river. Other critics note that Palode’s photos don’t contain anything with which we could compare the elephants to give us an idea of scale, and that his kallaana photos look a lot like a young Borneo pygmy elephants, and could actually be these. In 1995, KFRI conducted a search for kallaana after reports by “tribals.” January 2005 saw a KFRI survey supported by ecologists from the Bangalore-based IISc to look for kallaana, and for kallaana dung from which they could take DNA samples. But unexpectedly early “heavy rain… forced the officials to abandon the programme… The dung of the animals would get washed away in the heavy rain.” Dr. Easwaran of the KFRI said at the time that the Kani had misidentified “young and short elephants leaving the group and venturing out in search of water during summer months.” An unnamed forest official referred to the body found by Sali Palode and taken away for cremation, confirming that the body of a small elephant had recently been found (presumably the one found by Mani and Palode and removed for cremation). “At first we thought it was a calf,” commented Kerala’s Chief Conservator of Forests, a Mr Varghese. Surprising Asian elephant populations occasionally turn up, such as Sir John Bashford Snell’s 1993 encounter with a previously unknown group of six huge male elephants with high-domed heads, over 11ft (3.3 m), in the Royal Bardia National Park on the Indian-Nepali border (FT 70, 31). The pygmy hippo was written off as a “native legend” until the naturalist Robert Hermann Schomburgk brought one to Europe from Liberia in 1913. Pygmy hippos were until recently believed to have become extinct in the wild, another casualty of one of Africa’s many civil wars, until a pygmy hippo was photographed by a camera trap in the Liberian rainforest early last year (2008). Living deep in a forest, and with a need to run from leopard predators, the pygmy hippo would have a very similar ecological niche to the to putative kallaana. For details of the book Pygmy Elephants (Matt Salusbury, CFZ Press 2013) see here. The July/August online-only edition of the Freelance is out. Since then I've got a reply from the Met's Subject Access Office (partly) "rectifying" an incorrect record of a non-existent arrest following my "legal challenge." Watch this space for details. There's a related Panorama documentary on police surveillance planned for broadcast on Monday July 6. How to stay out of legal trouble, with media law lecturer Timothy Crooke. Finnish freelances fight new rights-grab contract. Tourist who took photographs on Underground up in court on 'harassment' charge, case dropped. Left to right (front): MPA members Jenny Jones, Valerie Brasse, Graham Speed. In the hot seat opposite, left to right: deputy police commissioner Chris Allison, deputy police commissioner Tim Godwin, MPA vice-chair Kit Malthouse, MPA chair, London Mayor and Telegraph columnist Boris Johnson. On his right: Catherine Crawford, MPA chief executive, Jane Harwood, MPA chief executive. 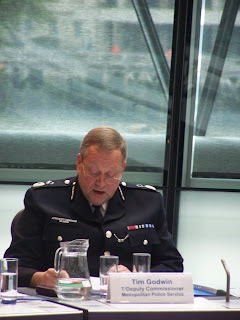 The policing of the G20 protests came under scrutiny today (Thursday 30 April 2009) at a public meeting of the Metropolitan Police Authority (MPA), the London Assembly body that watches over the Met. 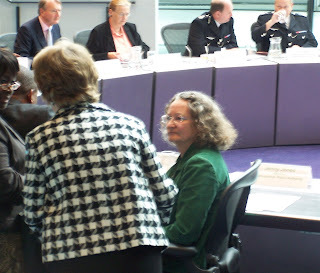 Assembly Member Jenny Jones in particular gave the police a run for their money, asking why the police had refused to let her into the Bank of England kettle, and why “very aggressive tactics” were used to remove the Bishopsgate Climate Camp. 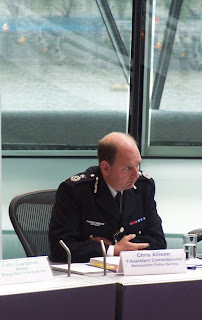 Assistant Commissioner Tim Godwin -– standing in for Commissioner Stephenson, who was recovering from appendicitis – and Assistant Commissioner Chris Allison – were there for a grilling. 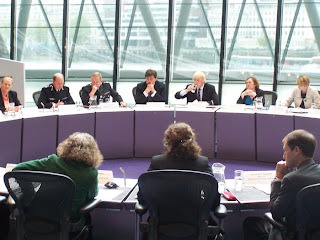 London Mayor Boris Johnson – who chaired the meeting – opened by saying of the G20 that “everybody in London and in the country (was) horrified by some of the images of what happened particularly to Ian Tomlinson, his family need answers and need them urgently.” Boris said he approved of the Independent Police Complaints Commission (IPCC) and Her Majesty’s Inspectorate of Constabulary inquiries, but reminded everyone that the police “do a fantastic job.” This was met by shouts of “Rubbish!” from the public gallery, the first of many lively interjections from the public, particularly from Class War people, and particularly on the subject of tasers. Boris later threatened to have the meeting “suspended” (closed to the public) if they didn’t shut up. One woman in the gallery was masked up as if for a demo. Tim Godwin for the Met said that while it was “probably unlawful for us to comment” on incidents of police conduct that are now under criminal investigation, but “we will not tolerate any MPS officers to make inappropriate comments via the internet” and that one officer had been resigned over this already. He admitted of the G20 policing that “we have a number of serious issues” that need to be addressed, and added, to laughter from the gallery, that the Met “can and want to learn better.” As Jenny Jones said, “I can hear the waves of doubt behind us” coming from the gallery. There was also laughter at Tim Godwin’s suggestion that some officers had no identification numbers on G20 duty because “some come off by accident.” He said, “anyone not doing that (displaying their number while on duty) will be in deliberate disobedience of a direct order.” The Met’s Clothing Board are on the case to make sure that reflective tabards will carry shoulder numbers, and coloured shoulder flashes identifying heads of “serials” that obscure shoulder numbers will be changed. Chris Allison said he’d been out on the Tamil protests enforcing police regulations on the wearing of identifying numbers. It was news to the MPA that the Met had very recently forked out £85,000 in compensation to those who “shouldn’t have been arrested” at an October 2008 Mexican Embassy protest. Why hadn’t they been told earlier? Boris agreed that there were “communications problems” between the Met and the MPA here. Chris Allision said that “there is no tactic that says as we release people we make them delete their photos. We fully accept that people are going to film us and have a right to film us.” Forcing people to delete film is “not a tactic and not a policy.” Boris said any cases the MPA hears of this will be brought before the Authority. John Biggs said he didn’t like the “innocent protester thing”, the casual distinction made by the police between “innocent protesters” and others who are somehow inherently wicked. Several MPA members pointed out that a policing tactics affect all Londoners, whether they were at the protests or not, and that many Londoners who were nothing to do with G20 may at some point, quite legitimately, want to go on protests in London in the future. “I’m sure 99 per cent of Londoners don’t have the faintest idea or what Section 4 or Section 14 (Public Order Act 1988) is. For ordinary Londoners in that (climate) camp, there’s a potential for a lot of confusion, a need to communicate more the reasons for clearing the camp, how it (blocking the highway with the camp) affects London.” He asked “whether people in the camp had it made clear to them that it needed to be cleared,” and that it was made clear to them by police that it was legitimate as well as strictly legal to do so. 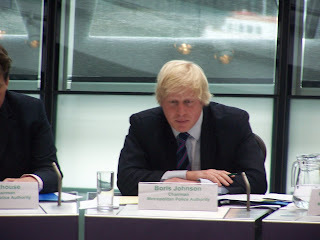 The MPA also criticized London Mayor and MPA Chair Boris Johnson in his “third role as a columnist.” Having (as Mayor) urged the media not to hype up the protests ahead of the G20, Boris in his 24th March Telegraph column predicted protesters would “surge like the orcs of Mordor” and described cider-fuelled protesters as “rioters”. While he admitted that his predictions had “not been vindicated by events” he said his words had turned out to be “an accurate description of some of the people there” and stopped short of promising not to do it again. 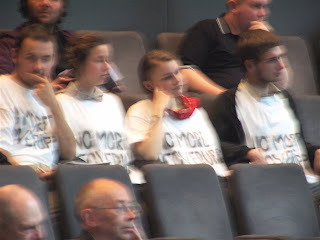 I couldn’t help noticing that the examples the Met cited of protests on which they based their G20 tactics were a long time ago – N30 (November 30 1999) and Mayday 2001 – tactics that were widely condemned at the time and, eight years later, now seem rather old. A transcript of the meeting and a webcast will be on www.london.gov.uk shortly, if it isn’t already. 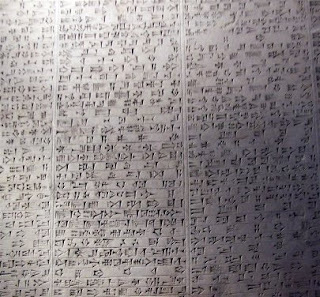 What's my photo of a Babylonian cunieform tablet doing here? Find out here. Print media industry magazine Press Gazette suddenly announced it will cease publication after the May issue, going the way of much of the media it reported on, but the Freelance, for freelance journalists everywhere, is still going strong, and the May 2009 online edition is now out. Keeping ethics alive (book review). An inspiring new book on the ethics of journalism deserves a wider readership than the obscurity of an internal union pdf publication that it will probably languish in. 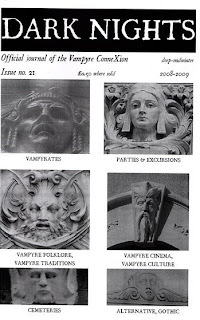 The 2009 Dark Nights - official journal of the Vampyre ConneXion is now out - mostly written, illustrated and designed (on Word!) 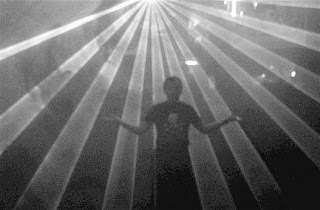 by myself. Features include the Camden Town fire, 'vampyrates' (vampire pirates), Japaneze vampaparazzi (photographers and reporters from Japanese lifestyle magazine Kara Maniax who doorstep attendees at vampire-themed fancy dress parties) and many more. This is likely to be the last Dark Nights for a while. 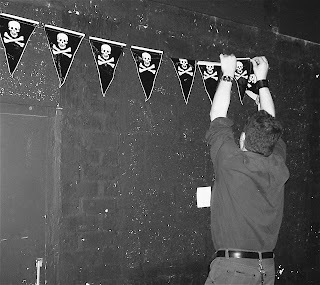 Harmless fancy dress vampire enthusiast societies, like banks, are feeling the pinch at the moment and merging, and what's left of the Vampyre ConneXion seems to be doing events jointly with former rivals the London Vampyre Group. Today BBC News warned today that coin testing companies are telling them that as many as one in twenty pound coins could be fakes. This is after the Royal Mint raised its estimate of the proportion of pound coins in circulation that are fakes to one in forty last September. Oxford Street drew one to my attention and refused to accept it. Since then, I've kept them, and I've got well over thirty. The giveaways are the rubbish lettering round the edge, the shallow relief on both sides, and the uneven circle of dots round the sides of each face. Some of them are really rubbish. There was a period a couple of years back when I would get several in my change at once, but now I'm actually finding less fake pound coins in my change. I'm parking these images below while I find the time to master Photoshop, after which I will re-post them with annotations pointing out those telltale signs of fakery. Look at the letter 'A' on the coin at the top, and the letter 'N' on the coin at the bottom. They're rubbish.